We are grateful that Dr. Jon Webb has served as Editorial Review Group Chair in Nephrology for the past six years, twice the three-year term we request of our Chairs. In that time, we have sent him 117 books, and he has organized reviews of 87 of them, recruiting 27 reviewers from his division, while also reviewing quite a few himself. Dr. Webb is an Associate Professor in the Division of Nephrology at the University of Kentucky. 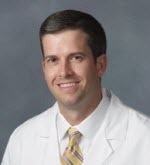 After attending Belmont University, Dr. Webb completed medical school, an internal medicine residency, and a nephrology fellowship at the University of Kentucky. He has been on faculty since 2010 and has had varied leadership roles, from clinical director of the outpatient nephrology clinic to medical director of a hemodialysis unit. He is currently the program director for the Nephrology Fellowship program and is active in clinical education with residents and students at the UK College of Medicine. Dr. Webb’s main areas of interests include bone and mineral metabolism, home dialysis, and medical education.